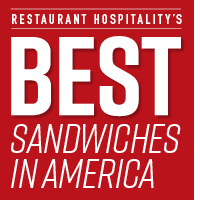 Every year, we're impressed with the many nominations we receive from restaurant operators for the Best Sandwiches in America. The sandwich is as popular with consumers as ever. In fact, recent research shows that on any given day, around half of all Americans eat a sandwich, according to the U.S. Department of Agriculture. Find out which sandwiches are trending and what consumers like.